Think about the amount of time you spend practicing, playing or fantasizing about the game. As much fun as you’re having now, wouldn’t you be having more fun if you played better? Of course, you would! 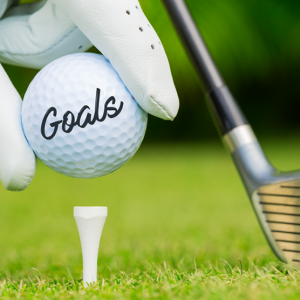 If you want to play better golf, and make better shots, then it’s time you set some goals! Even if it’s just two or three, some lessons with the right person should improve your golf this year and it’s crucial to have another set of eyes to help you with your feel for the game. The new breed of teaching professionals provides such a good learning experience that you’ll want to take as many lessons as you can. They’ll make it fun and you’ll eventually learn to diagnose your own faults and correct them on the fly. If you have a club or clubs that you’re hanging on to for sentiment’s sake, then you’re not doing yourself any favors. The game is hard enough as it is. Why handicap yourself with an ill-fitting set of clubs that offer you no chance to play to your potential? All things being equal, a full set of clubs that fit could be worth five, maybe six strokes a round, depending on your handicap. That’s not insignificant. Make time to practice your short game and putting this year, whether that be some great chipping drills or putting drills. This really is the area that can make such a difference to your scores and will be the catalyst for lowering your handicap. Expand your arsenal in 2019 by learning some new shots. The best golfers out there can hit pretty much every shot under the sun, whilst many amateurs are reduced to their stock fade and chip and run. Perhaps learn how to play that high, floating lob shot, or the penetrating low draw? Golfers in the Philippines are among the most spoiled of any in the world. We have caddies, umbrella girls and golf carts. Golf can add decades and quality to your life if you do one simple thing—walk. Walking a round of golf usually results in 15,000 or more steps on the golf course. Our bodies are self-healing machines. Activity is the key and movement is the way. The new rules of golf go went into effect in January. The game has been simplified to become more inclusive, easier to learn and to get us all to play faster. Since we are the ones that most stand to benefit, it behooves us to learn just what these new rules are. Changes have been many, and the number of rules themselves have been reduced from 34 to 24. Download a copy of the New Rules of Golf 2019 today. Playing more golf doesn’t necessarily mean playing more 18 hole rounds because that does take a lot of time. But perhaps playing more golf could mean the odd nine holes after work, some more driving range sessions or heading down to the club during your lunch break for some short game practice. Golf shouldn’t be taken too seriously unless your living relies upon you playing well. Enjoy your golf, your playing partners’ company and the fresh air and surroundings in 2019, it is your hobby after all! Know where your weaknesses are. Constructive criticism is a great way to improve upon your game. Grab a notebook and write down what your major weaknesses on the course are. By staying self-aware, you will be able to move forward in figuring out how you can improve upon each individual weakness. Write down your goals. Once you have your goals written out, break down each goal into specific deadlines that are attached to dates so that you can internally keep yourself accountable. Make sure when you are creating your goals that each of them motivates you to be better. Stay committed. Commitment is key. Wake up each day asking yourself what goal you will be committed to achieving on that day. None of your goals or resolutions will be achieved without staying committed, moving forward and making it happen. Accomplish these goals over the course of the coming year and you’ll become a better golfer. You’ll shoot better scores, know more about the golf swing and the game, have clubs that fit and have a good working knowledge of the rules to conduct yourself with distinction on any field of play. Share your knowledge and enthusiasm with others.